Pelmets and curtains reduce air circulation and consequent heat loss through the window glass during winter and heat leakage into the home during summer when the curtains are drawn. Forget the old way of making pelmets. No need to manufacture a box by cutting, glueing, clamping or screwing board together and then having to cover it with padding and fabric. It is tiring just thinking about it and that is why some of these projects have taken too long to complete or even get started. Well the good news is that the Variety Padded Pelmet Kits will make that job extremely easy and your project completed in a very short time. Why? - because all the hard work has been done for you and all that's left is for you to cover it in your own fabric. Even the padding is supplied and fitted. 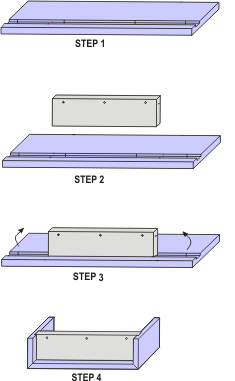 Wat makes it so easy, is that you will be working on a flat item instead of a box and also included is a helpful guide on DVD. When you have finished covering your pelmet in it's flat form it simply folds together as illustrated on the right of this page. Copyright 2006 Variety Furnishings. All Rights Reserved.